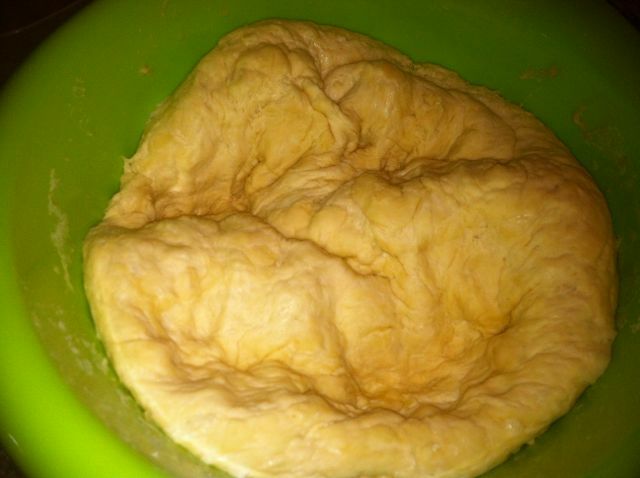 I had been searching for a pizza dough recipe that would be easy and versatile. I wanted to be able to keep it handy in the fridge for quick meals and even a small one for a snack here and there. I came across this recipe and tried it and it has been a huge hit! The original recipe can be found over at The Stay At Home Chef. This recipe is really easy and I did add a few more steps than what the original recipe description calls for. First, I always tend to proof my yeast by combining 3/4 cup of warm water, yeast, and a bit of sugar. I then add the remaining ingredients, flour, olive oil, salt, and the remaining water and sugar. I start out stirring with a wooden spoon but then usually get my hands in there to get the dough mixed well. 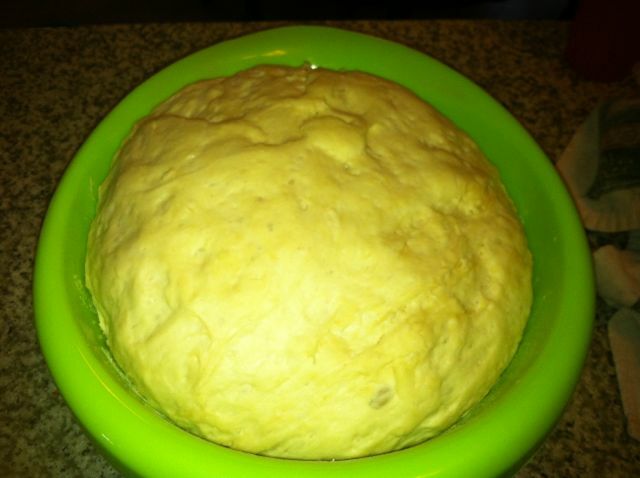 I place the covered dough in a warm, draft free place and let rise for 90 minutes. 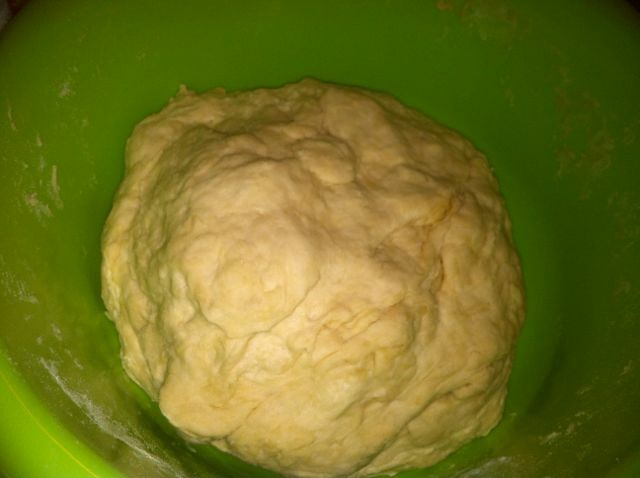 Once the dough has risen, I then punch it down and place it in a plasticware container to put in the refrigerator. Placed in container and ready for the refrigerator. 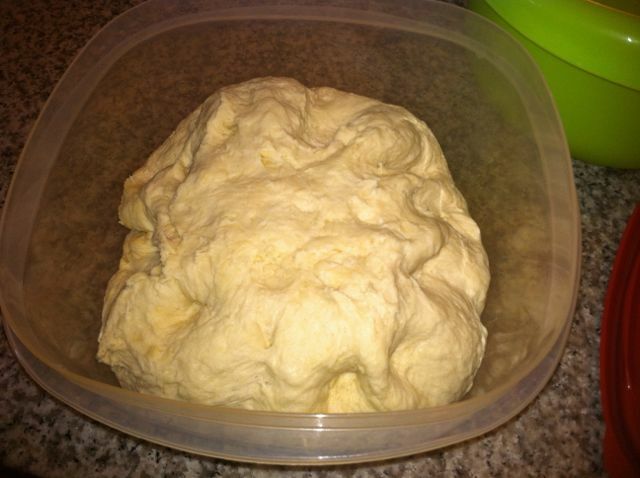 The first time I fixed this, I would go to the refrigerator a little bit after I put it in there and noticed, the dough would “explode” out of the container. I would need to punch it down again and put the lid back on. Perhaps I need a larger container, but right now I work with what I have. 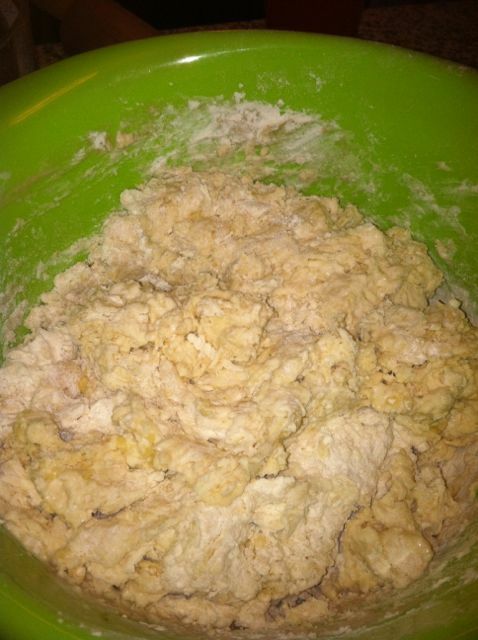 I just pay attention to the dough for a little bit after I place it in the fridge and make sure it doesn’t pop the top off the container. 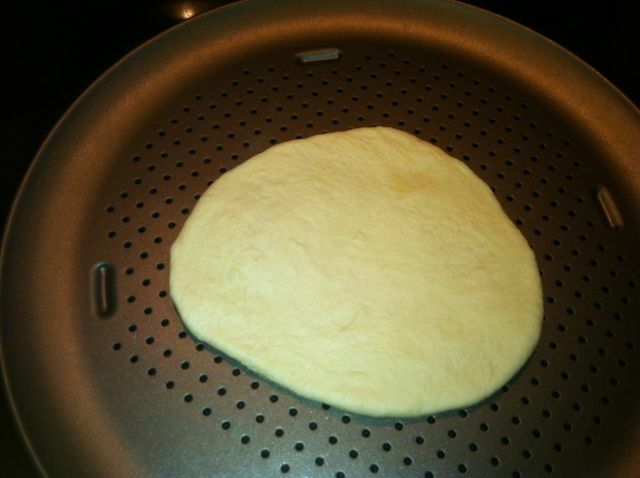 When you are ready to make a pizza, depending on size, you can pinch off the dough you need. 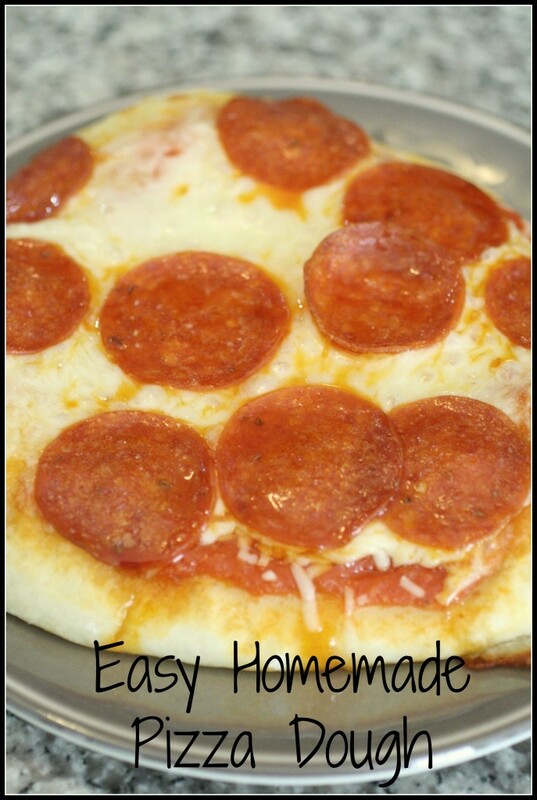 Roll the dough into a circle and top with your favorite toppings. I bake mine on a pizza tray in a 375˚ oven for 18 minutes and it comes out perfect for my taste. You can use a pizza stone if you have one, but it’s not necessary. The dough will make 4 medium pizzas, but we make personal pizzas and found that it will make 8 to 10 depending on size. 1. Combine 3/4 cup warm water, follow the temperature on your yeast, with the yeast. 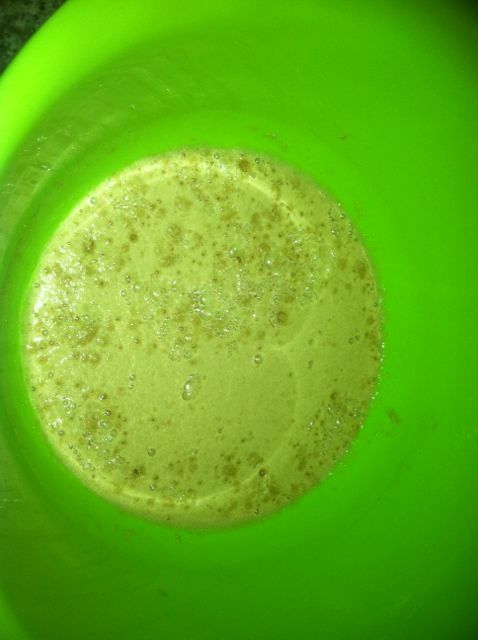 Measure out 1/4 cup brown sugar and take 1 tsp of that out of the cup and put in with the yeast and water. Let sit for 5 minutes. 2. Combine remaining ingredients in the bowl with the yeast. Mix thoroughly. Cover with a towel and let rise for 90 minutes. 3. 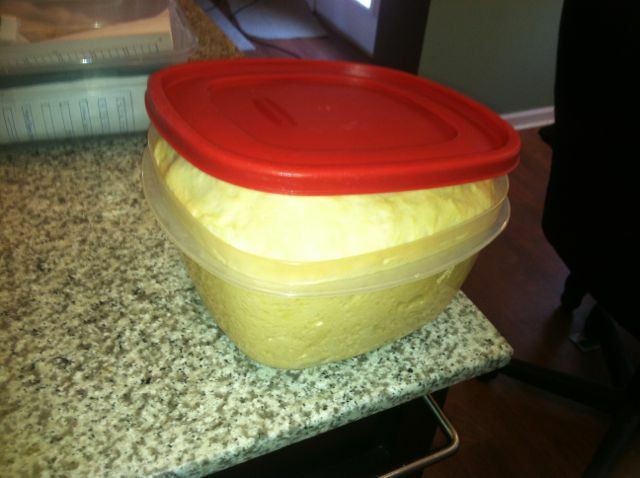 Punch down the dough and place in a plastic container and place in the refrigerator. 4. When you make a pizza, pinch off the dough. Roll out and top with your favorite toppings. Bake in a 375˚ oven for 18 minutes. We have not had the dough last longer than a week in our household, so I’m not sure if it would make it two weeks or not. It does start to taste a bit different towards the end of the week. I substituted one cup of wheat flour in one time and that tended to accelerate the tasting a bit different towards the end of the week.